East end of Second Street. 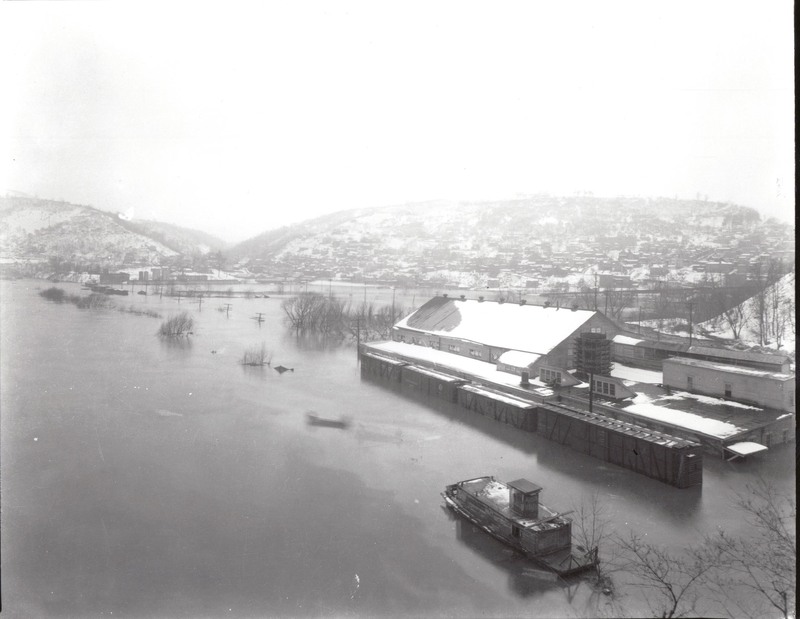 This picture doesn't have a date but probably the 1907 flood. This is the west end and the picture might have been taken from above the Patterson Field area. Many thanks to Frank Dawson for allowing us to use this picture. It is interesting trying to describe this picture. The left hand side of the picture is the proper location for the river normally. In the background a little left of center, short of the hills is the high school football stadium, Patterson Field. To the front and to the right of the picture you can see where the railroad tracks should be. BTW, the railroad cars sitting there are on a siding, not the main line. The main line of tracks would be a little left of those railroad cars. The smaller boat could be a house boat. The buildings behind the boxcars were the Golding & Sons Flint and Spar company. 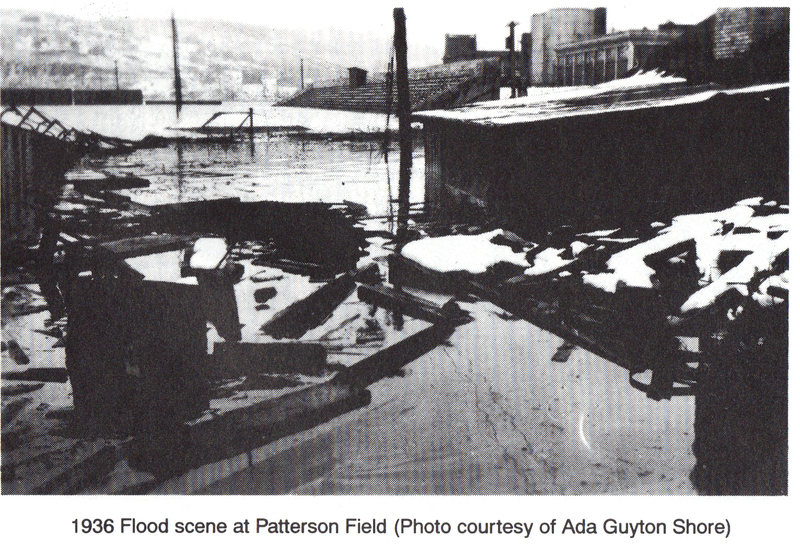 Patterson Field, the East Liverppool High School Football Staduim experiencing a unique problem confronted by river towns. Many thanks to Frank Dawson for allowing us to use this picture from his book "We are the Potters, 100 Years of East Liverpool High School Football by Frank "Digger" Dawson. Corolla Communications (1998). 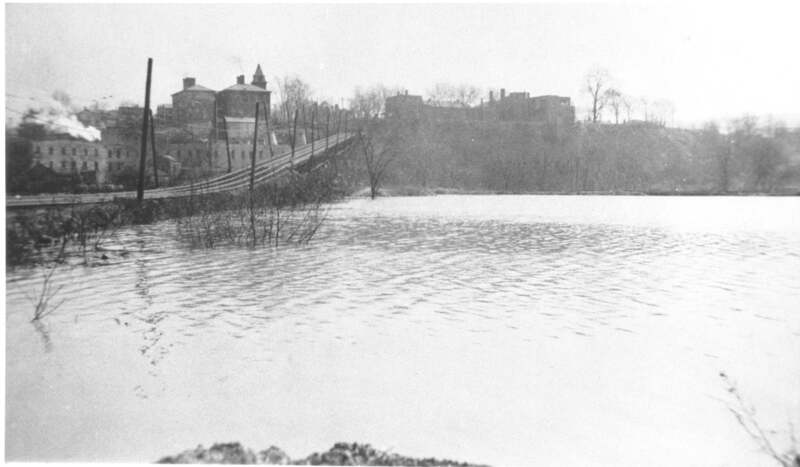 If you look to the back of this picture you can see railroad boxcars sitting on the tracks which are covered with water. The tracks are between the south end of Patterson Field and where the river normally flows. If you scroll back up and look at the other picture provided by Frank Dawson in this article you can see those same boxcars sitting along side Patterson field. It makes for a very nice connection between the two picutres.